The role of women in Islam is different from our civilization. According to the will of Allah, women are to be subjugated to men in all things. They must lead their lives according to a doctrine that is based on the dictates of the Koran and how Mohammed treated his wives and the other women around him. THE ISLAMIC DOCTRINE OF WOMEN reveals the details of Mohammed’s life in his home and bedroom where jealousy raged in his harem, how wife beating became a part of Islam after his move to Medina, how the Koran changed the laws of adoption so Mohammed could enjoy his daughter-in-law as a new member of his harem, and how child brides have been a part of Islam ever since Mohammed married six-year-old Aisha. The ideology found in this book rules hundreds of millions of women’s lives. Find out what their world is like under the Sharia and the Islamic doctrine of women. The “Kafir” world would do well to read this book. Everyone needs to read all of these books and equip themselves the best they can for an ideology that in fifty years..
A must for every woman who believes, that women are by the design of God, an intricate part of the man, and wish to continue their fight for equal rights as one half of the whole? Everyone needs to read all of these books and equip themselves the best they can for an ideology that in fifty years will simply out bread the rest of the religions and governments of the world! These books, may seem repaticious at first, but as the Apostle Peter said; Don’t tell me you’ve heard this before, for I tell you, you need to hear this over and over until it fills you up, and you overflow with it! Amen? Be an ENGLIGHTENED WOMAN about ISLAM! I wish to say upfront that I have read the koran – took me about a week as a lot of it is very repetitive – the theme of hating and killing Jews, Christians and non-believers (i.e us Infidels) hits home and there wasn’t any ‘religion of peace’ in the entire koran. Then I read Ayaan Hirsi Ali’s books, then I found Dr. Warner’s books which break down the study of islam. It’s clear, concise and well written. This is a blue print for what is in store for women who believe that the burka and nijab should be ‘worn by those who wish to do so” and hide their heads in the sand for what that burka really represents is the total repression of women and denial of any right. I still have nightmares of the Afghan women who were murdered in the soccer stadium, shot in the head wearing their blue burkas. Wake UP WOMEN! Don’t believe that islam is peaceful . STUDY AND LEARN STUDY AND LEARN. 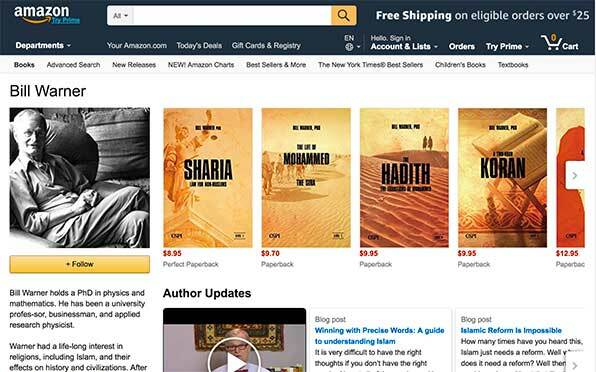 Dr. Warner’s books are true on facts and match the koran….read and learn and write your Congressmen and Senators about the HATE OF ISLAM. I am so totally floored by the President’s remarks about there is ‘no future for the critics of the prophet.” After understanding what is in the koran, I am totally horrified. I am an educated, intelligent professional – now a widow – and find that islam is a threat to ALL DEMOCRACIES! FREEDOMS of SPEECH and RELIGION. An essential “must read” for all Americans! Dr. Bill Warner has a well deserved reputation as one of the foremost scholars warning against the barbarism of Islam pertaining to Western Civilization’s concepts of freedom and liberty. The Islamic Doctrine of Woman is a “must read” for everyone suspicious of the “coexist” progaganda (myth) served-up by a deliberately deceptive American media machine. Islam seeks to “destroy” every American’s right to freedom and religious liberty, and women’s rights are their primary target. Skeptics should also read “The Arab Mind” to get an intimate view of how the West is mortally threatened by Islamic Jihad in the twenty-first century. After reading this book, I am better able to understand the position of women, the inequality of life in Muslim countries. The book beings out quotations from the Quran and there is no ambiguity understanding what they say and what they do.